According to the Centers for Disease Control and Prevention (CDC), stroke kills nearly 130,000 Americans each year—one out of every 18 deaths— making stroke the fourth leading cause of death in the United States. Stroke is also a leading cause of serious, long-term disability. Its effects include a broad range of cognitive and physical problems, such as speech and communication diffi culties, dementia, muscle spasticity and weakness, balance problems, and incontinence. Early recognition of stroke symptoms and prompt medical attention can help patients achieve better outcomes. In addition, many strokes can be prevented through lifestyle changes that address underlying risk factors. 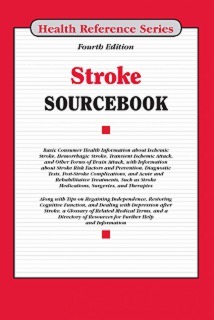 Stroke Sourcebook, 4th Edition, provides updated information about the causes, diagnosis, treatment, and prevention of stroke. It describes the different types of stroke, identifies stroke risk factors, and provides information on stroke diagnosis and treatment and post-stroke complications. Part I: Introduction to Stroke identifies the symptoms of stroke and discusses the incidence of stroke in children, men, women, and older adults. It also examines the impact of stroke in specific geographic regions and stroke-related health disparities among racial and ethnic populations. The part concludes with statistical information on stroke in the United States and recent findings in stroke research. Part II: Types of Stroke discusses the two major types of stroke, ischemic and hemorrhagic. It also describes transient ischemic attacks, which are often called mini strokes, and it addresses concerns about risk factors for recurrent strokes. Part III: Stroke Risk Factors and Prevention provides information about conditions that predispose a person to having a stroke, including atherosclerosis, carotid artery disease, atrial fibrillation, and peripheral artery disease. It also discusses the role that diabetes, high blood pressure, high cholesterol, obesity, inactivity, stress, smoking, and substance abuse play in stroke risk, and it offers strategies for stroke prevention through lifestyle changes. Part IV: Diagnosis and Treatment of Stroke offers information about common medical tests used to identify stroke. This part also explains stroke treatments that are instrumental in saving lives, including angioplasty, stent placement, carotid endarterectomy, and medications such as tissue plasminogen activator (tPA) and stem cell therapy. Part V: Post-Stroke Complications and Rehabilitation discusses the numerous cognitive and physical problems that stroke often causes, including brain damage, dementia, and difficulties with speech and communication. It also provides information about post-stroke rehabilitation for physical disabilities, including swallowing problems, muscle spasticity and weakness, balance problems, pain, bowel and continence issues, and vision problems. The part concludes with facts about therapies used to help patients with activities of daily living during the post-stroke period. Part VI: Life after Stroke identifies common concerns of stroke patients and their families after hospitalization or rehabilitation, such as kitchen, bathroom, and living room modifications that can improve home safety and mobility. The part also examines skin care, sleep, and depression issues often experienced after stroke. Tips for caregivers is also provided. It concludes with a discussion about choosing long-term care facilities and finding emotional support after a stroke. Part VII: Additional Help and Information provides a glossary of important terms related to stroke and a directory of organizations that offer information to stroke patients and their families and caregivers.